Package Include : 3-Pack 20 Ft copper security camera power cable. No more dealing with the hassle of changing batteries. No more denting your wallet buying expensive batteries. 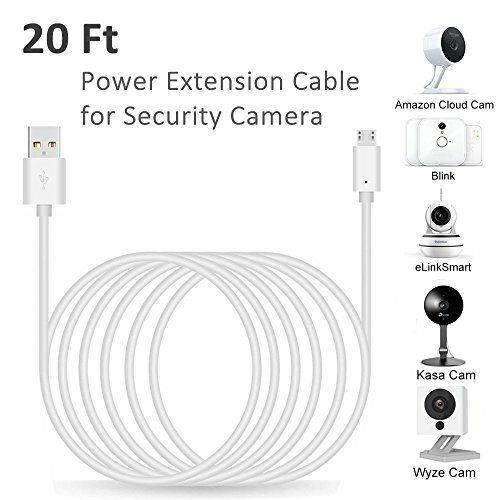 The COSCOD extra-long charging cable allows you to operate your Smart Security Camera round the clock by keeping it plugged in, and comes with a one-of-a-kind patent pending design for a mix of durability and functionality you can't find elsewhere. Don't risk it with charging cords that claim to do it all. We've specifically designed this cable for Security cameras and rigorously tested it to ensure that it gets the job done flawlessly. If you have any questions about this product by COSCOD, contact us by completing and submitting the form below. If you are looking for a specif part number, please include it with your message.